With all the pizzas we’ve made around here, I decided it was high time I got a crust recipe for you to use. And quite frankly, if I don’t get this posted I’m afraid the newspaper clipping might disintegrate at any moment, then I’d truly be lost. I’ve tried several different types of crusts and what I like about this one is that it’s EASY and gets a nice crispy crust with a chewy interior if baked at the right temperature. I’ve learned the trick to a crispy crust is to use bread flour and use a pizza stone while you bake. 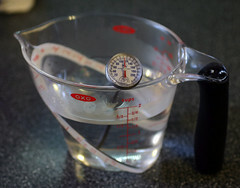 And if you want to get things off to a great start, make sure the water you use is 110 before adding it to your yeast. These directions are below in the recipe as well. 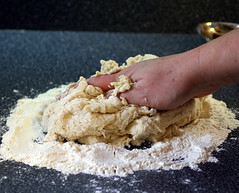 Turn the dough out on a lightly floured surface and start kneading. If the dough is too sticky, be sure to add additional flour as needed. 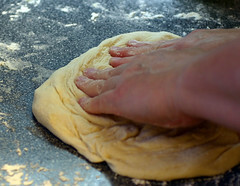 Continue to knead for five minutes, dough should form into a smooth ball. 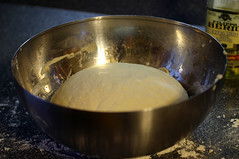 Spray or grease a bowl and set dough ball in the bowl and cover with a damp towel. Let rise until double in size. It should take about an hour depending on how warm your kitchen is. These directions are below in the recipe as well. Turn the dough out onto a lightly floured surface, divide in two equal pieces, cover with a towel and let rest for ten minutes, then you’re ready to stretch your dough out. 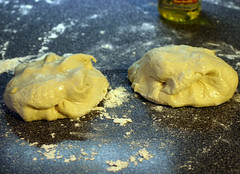 At this point you can also freeze your dough for later use, just wrap it up tightly. Whatever your choice, be sure to prick your crust before you top it or par bake it, so it won’t bubble up on you. Be sure to bake your pizza at 425°-450° and use a pizza stone, make sure the stone is hot before you set your pizza crust on it! 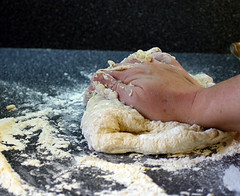 Turn the dough out on a lightly floured surface and start kneading. If the dough is too sticky, be sure to add additional flour as needed. 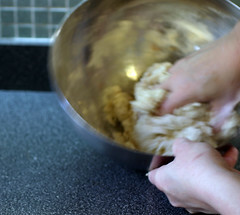 Continue to knead for five minutes, dough should form into a smooth ball. 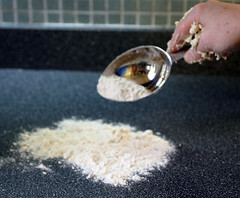 Turn the dough out onto a lightly floured surface, divide in two equal pieces, cover with a towel and let rest for ten minutes, then you’re ready to stretch your dough out. See video links above for good techniques. 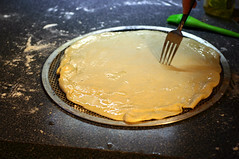 When your dough is ready, place it on a pizza screen, prick several holes in the crust with a dinner fork, then top your pizza and bake at 425-450 for 25 minutes or until your center is HOT and the cheese is nicely browned. It took me awhile to learn to LEAVE IT IN THE OVEN to make sure the crust bakes all the way through. Five minutes can make a world of difference! You will notice that there’s a baking temperature range, the reason: My oven can go as much as 25 degrees above what I set it to. So I have baked many pizzas as low as 425 as high as 450 and often times somewhere in the middle. They always turn out well, but leave a little guess work (and oven-sitting) for me each time. Find a good time/temperature ratio for your perfect pizza and stick to it. You are soooo right about a hot pan! I stumbled onto that “secrect” about six months ago. Now I preheat my cast iron skillet in a 450 oven, then put the pizza dough on it, add toppings and bake. Makes for a wonderful crust! A pizza stone or cast iron skillet is ESSENTIAL. I’ve never had to prick my dough, though. Great recipe. There is nothing better than homemade pizza dough. 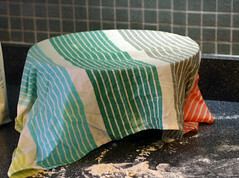 Yum – I used to make pizza every Friday night, but my husband got sick of it – what gives?! 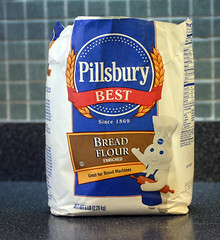 I’ll give yours a try because my go to dough: 2 cups flour, 1 cup tap water, 1 package yeast, 1 tsp. salt just mixes for a couple minutes, then I roll out and pre-bake before putting the toppings on. Beautiful display, as always! I too use bread flour and a pizza stone. Did you know they work well on the grill too? Picked up that tip after a hurricane! Thank you for the directions. Your pizza looks awesome! We like to have a thin crust. Yummy toppings on your pizza! Love the artichoke, red pepper and basil. Mary – you rock the pizza world, and no surprise you’re from Chicago.